The next generation of cosmological hydrodynamical simulations. Simulating cosmological volumes with magnetohydrodynamics. The interplay of feedback and accretion in galaxy halos and cosmic filaments. From dwarf galaxy to massive cluster scales. Connecting galactic scales to the large-scale structure of the universe. X-ray emission from the most massive objects. The cosmic web of Lambda-Cold Dark Matter structure formation. Evolution from just after the Big Bang to the present day. The IllustrisTNG project is an ongoing series of large, cosmological magnetohydrodynamical simulations of galaxy formation. TNG aims to illuminate the physical processes that drive galaxy formation: to understand when and how galaxies evolve into the structures that are observed in the night sky, and to make predictions for current and future observational programs. The simulations use a state of the art numerical code which includes a comprehensive physical model and runs on some of the largest supercomputers in the world. 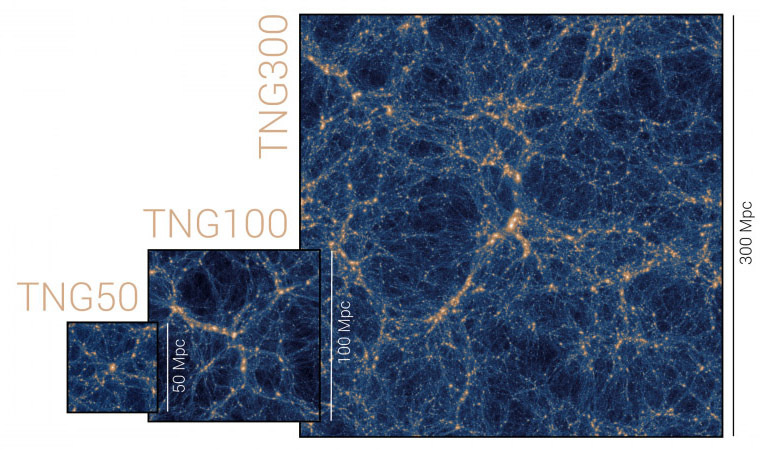 TNG is a successor to the original Illustris simulation and builds on several years of effort by many people. The project description page contains an introduction to the motivations, techniques, and early science results of the TNG simulations. Presently, the project includes three primary runs spanning a range of volume and resolution; these are called TNG50, TNG100, and TNG300. Updates for the simulation and related projects. The third and final simulation of the project, TNG50, is presented with two introductory papers. The TNG100 and TNG300 simulations are released! The date for the full public data release of the first two TNG simulations, TNG100 and TNG300, has been set for 17 December, 2018 (previously 7 Dec). TNG hits the news! With the publication of the first papers in MNRAS, a number of press releases from participating institutions have been sent out. Prof. Volker Springel was awarded the "Golden Spike Award" for his presentation of IllustrisTNG to HLRS, the computational center where the simulations are being run. Several new fields/overlays have been added to the TNG 2D explorer: dark matter (annihilation signal, velocity), gas (temperature, velocity, shock energy dissipation rate, synchrotron emission, HI column density), stars (optical light). The introductory paper series for TNG100 and TNG300 is posted, and the website launched. The TNG300 run finished on Hazel Hen. The TNG100 run finished on Hazel Hen. (c) 2019 The TNG Collaboration.